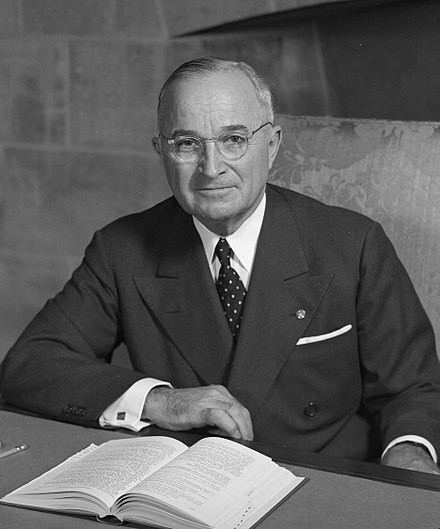 Harry S. Truman [lower-alpha 2] (May 8, 1884 – December 26, 1972) was the 33rd president of the United States from 1945 to 1953, succeeding upon the death of Franklin D. Roosevelt after serving as vice president. 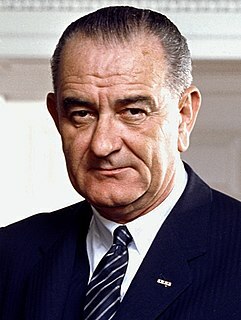 He implemented the Marshall Plan to rebuild the economy of Western Europe, and established the Truman Doctrine and NATO. Lamar is a city in and the county seat of Barton County, Missouri, United States. As of the 2010 census, the city population was 4,532. Lamar is well known as the birthplace of President Harry S. Truman. 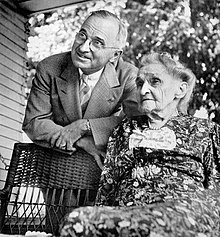 Martha Ellen Young Truman was the mother of U.S. president Harry Truman. Harrisonville is a city in Cass County, Missouri, United States. The population was 10,019 at the 2010 census. It is the county seat of Cass County. Belton is a city in Cass County, Missouri, United States, and part of the Kansas City metropolitan area. The population was 23,116 at the 2010 census. Vice President Henry Wallace was popular among Democratic voters, but he was viewed as too far to the left and too friendly to labor for some of Roosevelt's advisers. 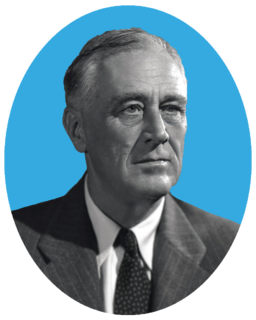 The President and several of his confidantes wanted to replace Wallace with someone more acceptable to Democratic Party leaders and Roosevelt's advisors, knowing that Roosevelt might not live out a fourth term. Outgoing Democratic National Committee chairman Frank C. Walker, incoming chairman Hannegan, party treasurer Edwin W. Pauley, strategist Ed Flynn, Chicago Mayor Edward Joseph Kelly, and lobbyist George E. Allen all wanted to keep Wallace off the ticket. 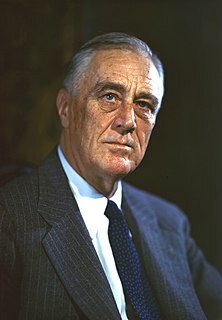 Roosevelt told party leaders that he would accept either Truman or Supreme Court Justice William O. Douglas. 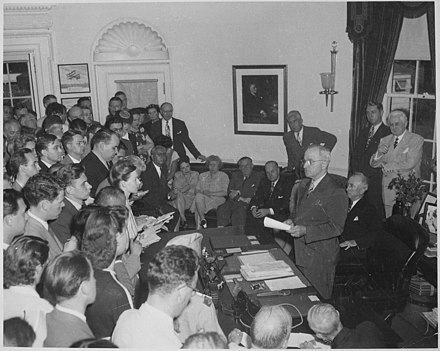 Truman's response to the widespread dissatisfaction and protest of U.S. citizens was generally seen as ineffective. The cost of consumer goods increased rapidly due to the removal of depression-era limits on the prices of everyday items while producers of the remaining price-controlled commodities struggled due to the artificially low prices of their goods. In 1945 and 1946, Farmers refused to sell grain for months even though it was desperately needed in the United States and to stave off starvation in Europe. Similarly, industrial laborers sought wage increases. In January 1946 a steel strike involving 800,000 laborers became the largest in the nation's history. It was followed by a coal strike in April and a rail strike in May; however, public opinion on labor action was mixed with one poll reporting a majority of the public in favor of a ban on strikes by public service workers and a year's moratorium on labor actions. To get Congress to spend the vast sums necessary to restart the moribund European economy, Truman used an ideological argument, arguing that Communism flourishes in economically deprived areas. 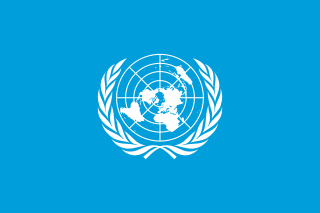 As part of the U.S. Cold War strategy, Truman signed the National Security Act of 1947 and reorganized military forces by merging the Department of War and the Department of the Navy into the National Military Establishment (later the Department of Defense) and creating the U.S. Air Force. The act also created the CIA and the National Security Council. 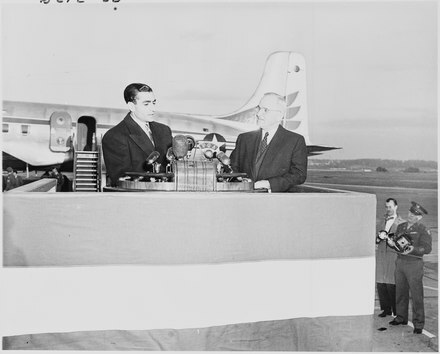 In 1952, Truman secretly consolidated and empowered the cryptologic elements of the United States by creating the National Security Agency (NSA). The Soviet Union's success in exploding an atomic weapon in 1949 and the fall of the nationalist Chinese the same year led many Americans to conclude subversion by Soviet spies was responsible, and to demand that communists be rooted out from the government and other places of influence. However, Truman got himself into deeper trouble when he called the Hiss trial a "red herring". Wisconsin Senator McCarthy accused the State Department of harboring communists and rode the controversy to political fame,  leading to the Second Red Scare,  also known as McCarthyism. Nevertheless, he seriously considered running for another term in 1952, and left his name on the ballot in the New Hampshire primary. However all his close advisors, pointing to his age, his failing abilities, and his poor showing in the polls, talked him out of it. 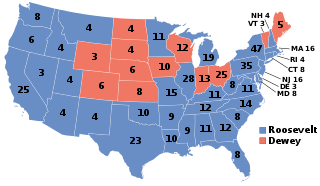 At the time of the 1952 New Hampshire primary, no candidate had won Truman's backing. 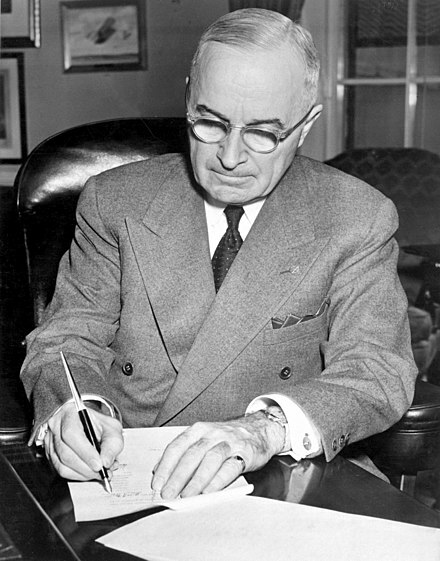 His first choice, Chief Justice Fred M. Vinson, had declined to run; Illinois Governor Adlai Stevenson had also turned Truman down, Vice President Barkley was considered too old,   and Truman distrusted and disliked Senator Kefauver, who had made a name for himself by his investigations of the Truman administration scandals. Upon leaving the presidency, Truman returned to Independence, Missouri, to live at the Wallace home he and Bess had shared for years with her mother. 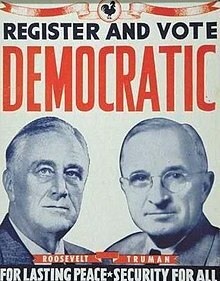 Once out of office, Truman quickly decided that he did not wish to be on any corporate payroll, believing that taking advantage of such financial opportunities would diminish the integrity of the nation's highest office. He also turned down numerous offers for commercial endorsements. Since his earlier business ventures had proved unsuccessful, he had no personal savings. 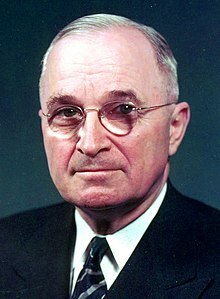 ↑ Truman was Vice President under President Franklin D. Roosevelt and became President upon Roosevelt's death on April 12, 1945. 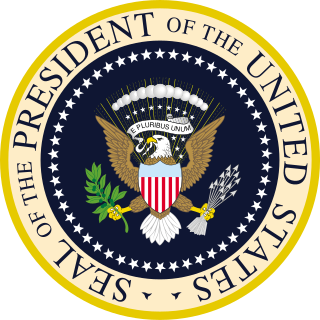 As this was prior to the adoption of the Twenty-Fifth Amendment in 1967, a vacancy in the office of Vice President was not filled until the next ensuing election and inauguration. ↑ For example, see Fussell, Paul (1988). "Thank God for the Atomic Bomb". Thank God for the Atomic Bomb and Other Essays. New York Summit Books. 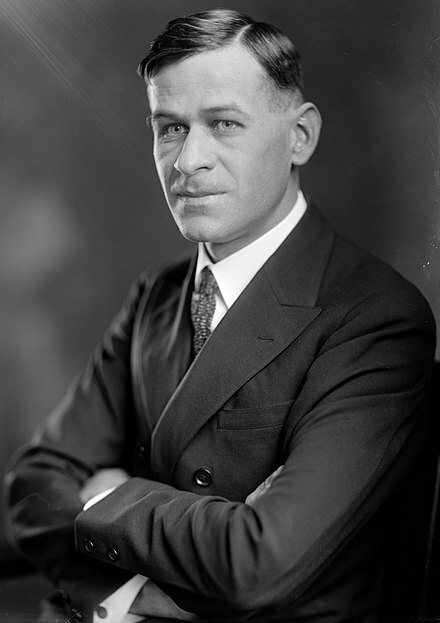 John William Bricker was a United States Senator and the 54th Governor of Ohio. 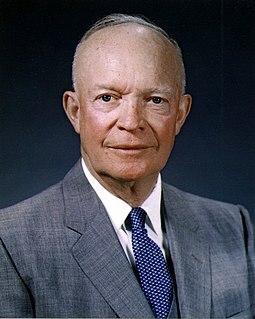 He was also the Republican nominee for Vice President in 1944. Robert Hugh Ferrell was an American historian and a prolific author or editor of more than 60 books on a wide range of topics, including the U.S. presidency, World War I, and U.S. foreign policy and diplomacy. One of the country's leading historians, Ferrell was widely considered the preeminent authority on the administration of Harry S. Truman, and also wrote books about half a dozen other 20th-century presidents. He was thought by many in the field to be the "dean of American diplomatic historians," a title he disavowed. 1 2 Ferrell 1994, p. 108. ↑ "County Judges 1923-1972". County History: County Judges. Kansas City, MO: Jackson County, Missouri. 2018. Retrieved April 20, 2018. 1 2 "County Judges 1923-1972". 1 2 Ferrell 1994, p. 99. ↑ "County Judges 1826-1922". County History: County Judges. Kansas City, MO: Jackson County, Missouri. 2018. Retrieved April 20, 2018. ↑ "Use of the Period After the "S" in Harry S. Truman's Name". Harry S. Truman Library & Museum. Retrieved March 5, 2016. ↑ McCullough 1992, p. 37. ↑ McCullough 1992, pp. 27, 37. ↑ Niel Johnson; Verna Gail Johnson (1999). "Rooted in History: The Genealogy of Harry S. Truman". Harry S. Truman Library – Genealogy. Retrieved May 6, 2018. .
↑ "Ulster-Scots and the United States Presidents" (PDF). Ulster Scots Agency. Retrieved July 12, 2010. ↑ Truman Library, Birth 2012. ↑ McCullough 1992, pp. 37, 77, 1112. ↑ Devine, Michael J. (2009). 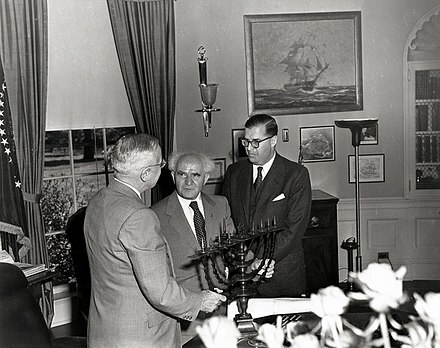 Harry S. Truman, the State of Israel, and the Quest for Peace in the Middle East. Truman State Univ Press. p. 93. ISBN 978-1-935503-80-4. ↑ Schultz, Joseph P. (1982). Mid-America's Promise: A Profile of Kansas City Jewry. Jewish Community Foundation of Greater Kansas City. p. 33. ↑ "San Francisco Jewish Bulletin, Volume 129". Jewish Community Publications. 1979. p. v.
1 2 3 Oshinsky 2004, pp. 365–380. ↑ McCullough 1992, p. 38. ↑ Ferrell 1994, p. 87. ↑ Truman Library & 2012aa. ↑ Ferrell, Robert H. (1994). Harry S. Truman: A Life. Columbia, MO: University of Missouri Press. pp. 25–26. ISBN 978-0-8262-1050-0. ↑ Truman Library, Job 2012. ↑ Gies, Joseph (1968). Harry S. Truman: A Pictorial Biography. New York: Doubleday. p. 5. ↑ McCullough 1992, pp. 67, 99. ↑ McCullough 1992, pp. 78–79. ↑ Ferrell, Robert H. (1994). Harry S. Truman: A Life. Columbia, MO: University of Missouri Press. p. 52. ISBN 978-0-8262-1050-0. ↑ Ferrell, Robert H. (1994). Harry S. Truman: A Life. Columbia, MO: University of Missouri Press. p. 53. ISBN 978-0-8262-1050-0. ↑ Ferrell, Robert H. (1994). Harry S. Truman: A Life. Columbia, MO: University of Missouri Press. p. 79. ISBN 978-0-8262-1050-0. ↑ KirKendall, Richard Stewart (1989). The Harry S. Truman Encyclopedia. Boston: G. K. Hall. p. 40. ↑ Danilov, Victor J. (2013). 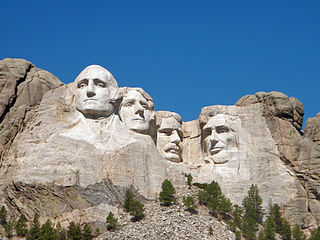 Famous Americans: A Directory of Museums, Historic Sites, and Memorials. Lanham, MD: Scarecrow Press. p. 268. ISBN 978-0-8108-9185-2. 1 2 Hamby 1995, pp. 17–18, 135. ↑ Miller, Richard Lawrence (1986). 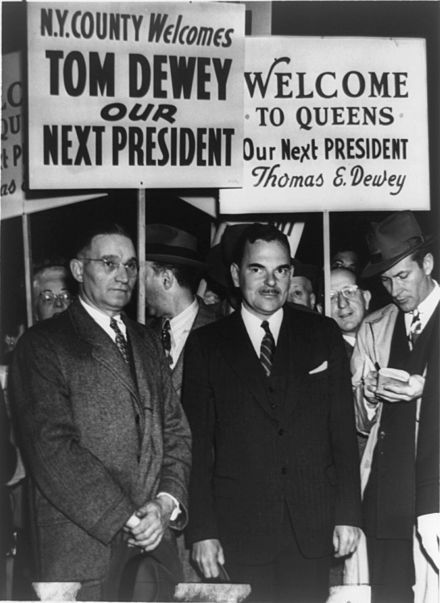 Truman: The Rise to Power. New York: McGraw-Hill. p. 206. ISBN 978-0-07-042185-1. ↑ Gross, Norman (2004). America's Lawyer-Presidents: From Law Office to Oval Office. Evanston, IL: Northwestern University Press. p. 260. ISBN 978-0-8101-1218-6. ↑ Jackman, Tom (Kansas City Star) (September 20, 1996). 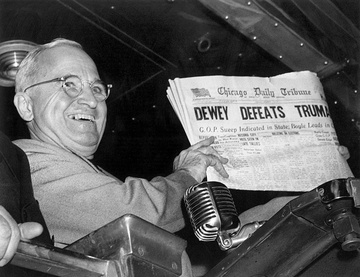 "49 Years Later, Truman Gets His Law License". Tuscaloosa News. Tuscaloosa, AL. p. 1D. 1 2 3 4 5 6 Gilwee 2000. ↑ Truman Library, Eye 2012. ↑ Ferrell, Robert H., ed. (1998). 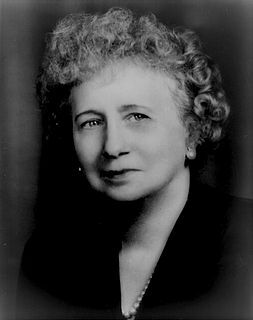 Dear Bess: The Letters from Harry to Bess Truman, 1910–1959. Columbia, MO: University of Missouri Press. p. 219. ISBN 978-0-8262-1203-0. ↑ Offner, Arnold A. (2002). 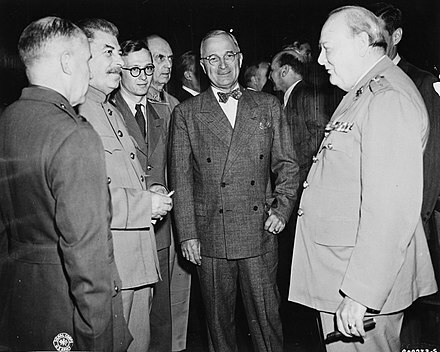 Another Such Victory: President Truman and the Cold War, 1945–1953. Stanford, CA: Stanford University Press. p. 6. ISBN 978-0-8047-4254-2. 1 2 Another Such Victory, p. 6. ↑ McCullough 1992, pp. 105–110. ↑ Current, Freidel & Williams 1971, p. 594. ↑ McCullough 1992, p. 115. ↑ Burnes 2003, p. 49. ↑ Farinacci, Donald J. (2017). Truman and MacArthur: Adversaries for a Common Cause. Hoosick Falls, NY: Merriam Press. pp. 71–72. ISBN 978-1-57638-630-9. 1 2 3 4 5 Farinacci, pp. 71–72. ↑ McCullough 1992, pp. 130, 531. ↑ Giangreco 2002, p. 192. ↑ Giangreco 2002, pp. 181–186. ↑ Daniels, Roger (2010). 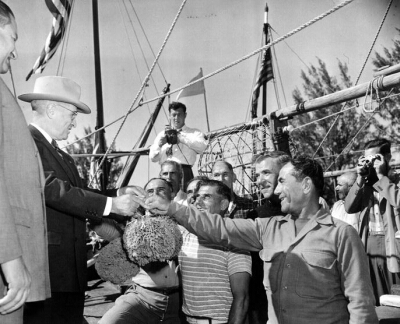 Immigration and the Legacy of Harry S. Truman. Kirksville, MO: Truman State University Press. p. 1. ISBN 978-1-931112-99-4. ↑ Espinosa, Gastón (2009). Religion and the American Presidency. New York: Columbia University Press. p. 220. ISBN 978-0-231-14333-2. ↑ Nielsen, Niels C. (2009). God In The Obama Era. New York: Morgan James Publishing. pp. 152–153, 156. ISBN 978-1-60037-646-7. ↑ Tiernan, L. Curtis. "Biographical Sketch, L. Curtis Tiernan". Monsignor L. Curtis Tiernan Papers. Independence, MO: Harry S. Truman Presidential Library & Museum. Retrieved May 21, 2018. ↑ "Biographical Sketch, L. Curtis Tiernan". ↑ "FAQ: Was President Truman the first Baptist president?". Harry S. Truman Library & Museum. Retrieved March 5, 2016. .
↑ Spalding, Elizabeth Edwards (2009), "Religion and the presidency of Harry S. Truman", in Espinosa, Gastón, Religion and the American Presidency: George Washington to George W. Bush, pp. 219–249 . ↑ Sobel, Robert (1990). 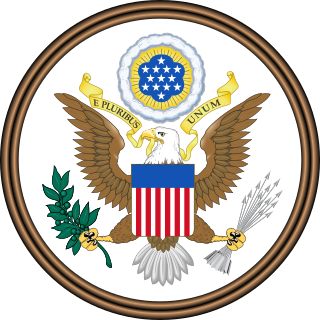 Biographical Directory of the United States Executive Branch, 1774–1989. Westport, CT: Greenwood Press. p. 358. ISBN 978-0-313-26593-8. ↑ Pullen, Randy (1999). "Twice the Citizen—And Then Some". Army Reserve magazine. Washington DC: U.S. Army Reserve: 12. ↑ Clay, Steven E. (2010). US Army Order of Battle, 1919–1941. Ft. Leavenworth, KS: Combat Studies Institute Press. p. 878. ↑ Tucker, Frank (December 1, 2010). "Army History: Truman, you're too old ...". Gateway Today. St. Louis: Association of the United States Army, St. Louis Chapter. pp. 5–8. ↑ Maddox, Robert James (2007). Hiroshima in History: The Myths of Revisionism. Columbia, MO: University of Missouri Press. p. 77. ISBN 978-0-8262-1732-5. ↑ "Biographical Sketch: Harry S. Truman, 33rd President of the United States". Trumanlibrary.org. Harry S. Truman Library and Museum. Retrieved May 27, 2016. ↑ "Harry S. Truman Military Personnel File". Record Group 407. Washington DC: National Archives. 1917–1973. 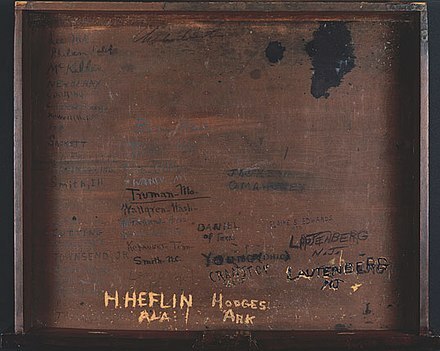 Retrieved December 17, 2018– via Harry S. Truman Presidential Library and Museum. ↑ McCullough 1992, pp. 63–64, 68. 1 2 Ferrell 1994, p. 88. ↑ Ferrell 1994, p. 86. ↑ Hamby 1995, pp. 410–412. 1 2 Dallek 2008, p. 6. 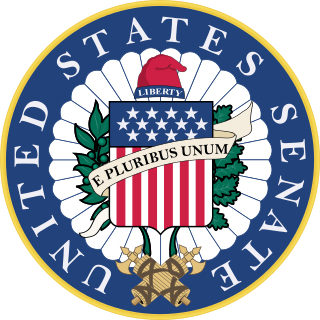 1 2 United States Senate 2012. ↑ Kirkendall, Richard Stewart (1989). The Harry S. Truman Encyclopedia. Boston: G. K. Hall. p. 27. ISBN 978-0-8161-8915-1. ↑ Dallek 2008, pp. 7–9. 1 2 3 Winn 2000. ↑ Time& January 8, 1973. ↑ Dallek 2008, pp. 11–12. ↑ Hamby 1995, pp. 236–247. ↑ Alexrod, Alan. The Real History of the Cold War: A New Look at the Past. Sterling. p. 44. ↑ Michael James Lacey (1991). The Truman Presidency. pp. 35–36. ↑ Dallek 2008, pp. 12–14. ↑ Herman, Arthur (2012), Freedom's Forge: How American Business Produced Victory in World War II, New York: Random House, pp. 103, 118, 194, 198–199, 235–236, 275, 281, 303, 312, ISBN 978-1-4000-6964-4 . ↑ Life& November 30, 1942. ↑ McCullough 1992, pp. 337–338: "Later estimates were that the Truman Committee saved the country as much as $15 billion." ↑ McDonald 1984: "This committee saved billions in taxpayers' money by helping eliminate waste and fraud." ↑ Daniels 1998, p. 228: Jonathan W. Daniels quotes journalist Marquis Childs who wrote in November 1942 that the Truman Committee had "saved billions—yes, billions—of dollars." ↑ Hamilton 2009, p. 301: "Over seven years (1941–1948) the committee heard from 1,798 witnesses during 432 public hearings. It published nearly two thousand pages of documents and saved perhaps $15 billion and thousands of lives by exposing faulty airplane and munitions production." ↑ Senate Truman Committee 2012. ↑ McCullough 1992, pp. 373–378. ↑ Dallek 2008, pp. 14–16. ↑ Dallek 2008, pp. 15–17. ↑ Occasions When Vice Presidents Have Voted to Break Tie Votes in the Senate, Senate Historical Office, United States Senate, p. 7. ↑ Harold Foote Gosnell, Truman's Crises: A Political Biography of Harry S. Truman (Greenwood Press, 1980), p. 212: "On only one occasion did [Truman] break a tie, and this was when his negative vote defeated a Taft amendment to the Lend-Lease Act which would have prevented postwar delivery of lend-lease goods contracted for during the war." ↑ Robert C. Byrd, Senate, 1789–1989, Vol. 1: Addresses on the History of the United States Senate (Government Printing Office, 1988), p. 534: "In his eighty-two days as vice president, he had the opportunity to vote only once--on an amendment to limit the Lend-Lease extension bill. The vote was tied, and Truman voted no, which, in a sense, was unnecessary since the bill would have died even without his vote." 1 2 U.S. History 2012. ↑ Schwab, Nick (August 13, 2014). "Lauren Bacall and Harry Truman's Piano Moment Led to Bigger Things". US News. Retrieved December 17, 2016. ↑ Goodwin 1994, p. 478. ↑ McCullough 1992, p. 366. ↑ Hamby 1995, pp. 301–302, 472. ↑ Hamby 1995, pp. 474. ↑ McCullough 1992, p. 511. ↑ McCoy 1984, pp. 21–22. ↑ Dallek 2008, pp. 19–20. ↑ Alexrod, Alan. The Real History of the Cold War: A New Look at the Past. Sterling. p. 56. ↑ "Total Casualties – The Atomic Bombings of Hiroshima and Nagasaki". atomicarchive.com. Retrieved December 16, 2016. ↑ Miller 1974, pp. 227–231. ↑ Dallek 2008, pp. 24–28. ↑ Kramer, Ronald C; Kauzlarich, David (2011), Rothe, Dawn; Mullins, Christopher W, eds., "Nuclear weapons, international law, and the normalization of state crime", State crime: Current perspectives, pp. 94–121, ISBN 978-0-8135-4901-9 . ↑ "Hiroshima und Nagasaki: Wessen Schuld?". zeit.de. Retrieved June 8, 2018. 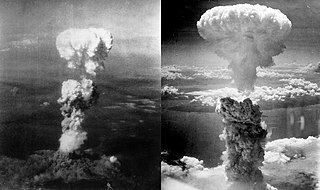 ↑ "Hiroshima, crimen imperdonable". elespectador.com. August 13, 2008. Retrieved June 8, 2018. ↑ "Rezension: Sachbuch: Gefügige Russen, tote Japaner" . Retrieved June 8, 2018– via www.faz.net. ↑ Ryall, Julian (June 4, 2015). "US museum must call Hiroshima and Nagasaki 'war crimes', say Japanese" . Retrieved June 8, 2018– via www.telegraph.co.uk. ↑ Scherer, Klaus (2015). Nagasaki - Der Mythos der zweiten Bombe. Munich: Hanser Verlag. ISBN 978-3446249479. ↑ Mitchell, Greg (August 9, 2016). "71 Years Ago: When Truman Failed To Pause -- And The Nagasaki War Crime Followed". huffingtonpost.com. Retrieved June 8, 2018. ↑ "「なんであんな殺され方をしたのか、私は知りたい。あの世で、ちゃんとお兄ちゃんに説明できるように」――原爆投下から70年。広島の被爆者が語った原爆被害と戦争への思い - IWJ Independent Web Journal". iwj.co.jp. August 6, 2015. Retrieved June 8, 2018. ↑ "Harry S. Truman: Address in Milwaukee, Wisconsin". www.presidency.ucsb.edu. Retrieved June 8, 2018. ↑ Lambers, William (May 30, 2006). Nuclear Weapons. William K Lambers. p. 11. ISBN 0-9724629-4-5. 1 2 3 Miller Center 2012. ↑ McCoy 1984, pp. 54–55. ↑ McCullough 1992, pp. 498–501. ↑ McCullough 1992, pp. 501–506. ↑ Acacia, John (2009). Clark Clifford: The Wise Man of Washington. p. 22. ↑ McCoy 1984, pp. 64–65. ↑ Dallek 2008, pp. 48–50. ↑ McCoy 1984, pp. 96–102. ↑ Markel, Howard (2015), "'Give 'Em Health, Harry'", Milbank Quarterly, 93 (1): 1–7, doi:10.1111/1468-0009.12096, PMC 4364422 . ↑ Dallek 2008, pp. 84–86. ↑ Binning, Esterly & Sracic 1999, p. 417. ↑ Lamb, Charles M; Nye, Adam W (2012), "Do Presidents Control Bureaucracy? The Federal Housing Administration during the Truman‐Eisenhower Era", Political Science Quarterly, 127 (3): 445–467, doi:10.1002/j.1538-165x.2012.tb00734.x, JSTOR 23563185 . ↑ Neustadt 1954, pp. 349–381. ↑ Hamby 1995, p. 310. ↑ Dallek 2008, pp. 56–57. ↑ James M. McCormick, and Eugene R. Wittkopf. "Bipartisanship, partisanship, and ideology in congressional-executive foreign policy relations, 1947–1988." Journal of Politics 52.4 (1990): 1077–1100. ↑ McCullough 1992, pp. 595–597. 1 2 McCullough 1992, p. 599. ↑ Ottolenghi 2004, pp. 963–988. ↑ Baylis, Thomas. How Israel was Won: A Concise History of the Arab-Israeli Conflict , p. 55 (Lexington Books, Rowman and Littlefield, 1999). ↑ Holmes, David. The Faiths of the Postwar Presidents: From Truman to Obama , pp. 16–17. (U. Georgia Press, 2012). ↑ McCullough 1992, pp. 604–605. 1 2 Hechler & Elsey 2006. ↑ "Harry S. Truman: Address in St. Paul at the Municipal Auditorium". www.presidency.ucsb.edu. Retrieved October 29, 2018. ↑ "A quote by Harry Truman". www.goodreads.com. ↑ "President Harry Truman on Republicans". October 5, 2012. ↑ "Ten Quotes About Republicans From Harry Truman". November 22, 2014. ↑ Board, The Editorial (November 24, 2017). "Opinion – When a Tax Cut Costs Millions Their Medical Coverage" – via NYTimes.com. ↑ Center of Military History 2012. ↑ McCoy 1984, pp. 153–158. ↑ Pietrusza 2011, pp. 226–232. ↑ "Footnotes on Political Battles of 1948". Truman's Library. Truman's Library. Retrieved January 28, 2016. ↑ Bray, William J. 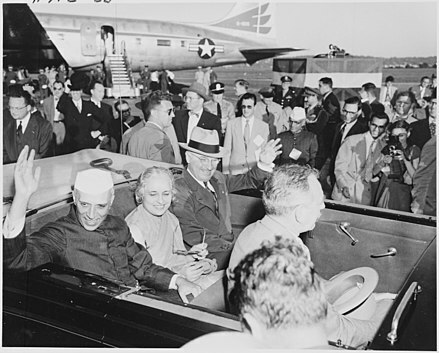 "Recollections of the 1948 Campaign". Truman's Library. Truman's Library. Retrieved January 28, 2016. ↑ Curran & Takata 2002. ↑ United States Senate 2005. 1 2 McCoy 1984, pp. 222–27. ↑ Truman Library, Memo 1950. ↑ Dean, John (2007), Broken Government: How Republican Rule Destroyed the Legislative, Executive, and Judicial Branches, Penguin, pp. 257, 315 . ↑ Matray 1979, pp. 314–333. ↑ Stokesbury 1990, pp. 81–90. ↑ Cohen & Gooch 2006, pp. 165–195. ↑ Stokesbury 1990, pp. 123–129. 1 2 Time& December 3, 1973. ↑ "How the Korean War Almost Went Nuclear". 1 2 Presidential Job Approval for Richard Nixon at the American Presidency Project. ↑ Wells 1979, pp. 116–158. ↑ McCoy 1984, pp. 197–199, 232. ↑ Dallek 2008, pp. 89–91. ↑ May 2002, pp. 1001–1010. ↑ Ferrell 1994, pp. 217–218, 224. 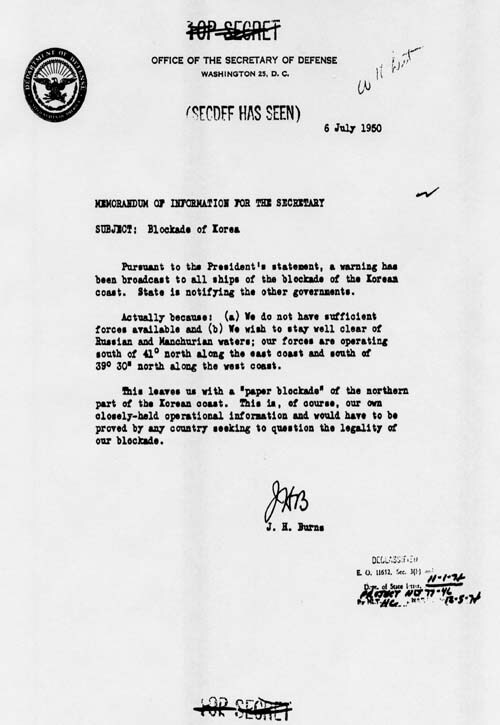 ↑ "Harry S Truman, "Statement on Formosa," January 5, 1950". University of Southern California . Retrieved 2019-04-02. ↑ Donovan 1983, pp. 198–199. ↑ Marolda, Edward J. "The Seventh Fleet in Chinese Waters". Archived from the original on May 26, 2014. Retrieved December 5, 2014. ↑ Mark S. Byrnes,"'Overruled and Worn Down': Truman Sends an Ambassador to Spain." Presidential Studies Quarterly 29.2 (1999): 263–279. ↑ Dallek 2008, pp. 87–88. ↑ McCoy 1984, pp. 194, 217–218. ↑ Richard S. Kirkendall (2012). The Civil Liberties Legacy of Harry S. Truman. Truman State UP. p. 124. ↑ Weinstein 1997, pp. 450–451. 1 2 McCoy 1984, pp. 216–217, 234–235. 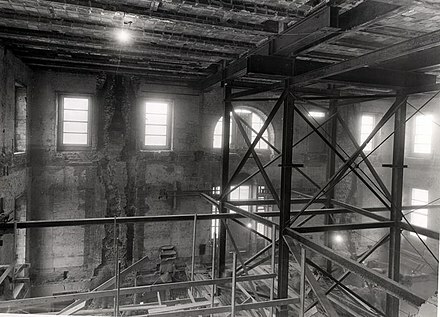 ↑ White House Museum 1952. ↑ Truman Library, Balcony 2012. ↑ Truman Library, Balcony II 2012. ↑ McCullough 1992, pp. 593, 652, 725, 875ff. ↑ Nohlen, Dieter (2005), Elections in the Americas: A Data Handbook, I, p. 556, ISBN 978-0-19-928357-6 . ↑ Donovan 1983, pp. 116–117. 1 2 Truman Library, FAQ 1950. ↑ Eleonora W. Schoenebaum, ed. Political Profiles: The Truman Years (1978) pp. 48–49. ↑ Christopher N.J.Roberts. "William H. Fitzpatrick's Editorials on Human Rights (1949)". Quellen zur Geschichte der Menschenrechte. Retrieved November 4, 2017. ↑ Truman Library, Special Message 1948. ↑ Kirkendall 1989, pp. 10–11. ↑ MacGregor 1981, pp. 312–315, 376–378, 457–459. ↑ "Travels of President Harry S. Truman". U.S. Department of State Office of the Historian. ↑ Alonzo L. Hamby. Man of the People: A Life of Harry S. Truman (1995), pp. 602–605. 1 2 McCullough 1992, p. 887. 1 2 Ambrose 1983, p. 515. ↑ Dallek 2008, pp. 139–142. ↑ Time& November 10, 2008. ↑ Dallek 2008, p. 144. 1 2 Truman Library 2012i. ↑ McCullough 1992, p. 1099. ↑ Time& August 13, 1956. ↑ McCullough 1992, p. 949; quoting Nevins 1955. ↑ Truman 1955, title page. ↑ Truman 1956, title page. ↑ Burnes 2003, pp. 217–218. ↑ Skidmore 2004, pp. 123–124. 1 2 Truman Library 1965. 1 2 "6:00 p.m." CBS Radio News. CBS. December 25, 1972. Retrieved December 27, 2017– via YouTube. ↑ Washington National Cathedral 2012. ↑ Donovan, Robert J. 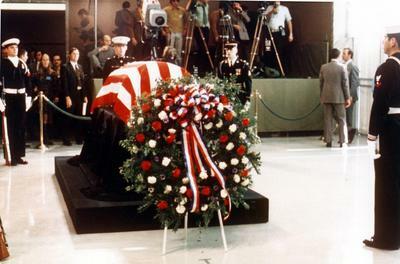 (1977). Conflict and Crisis: The Presidency of Harry S. Truman, 1945–1948. p. xv. ↑ Lubell, Samuel (1956). The Future of American Politics (2nd ed.). Anchor Press. pp. 9–10. ↑ Wisconsin Magazine of History& Autumn 1975. ↑ Dallek 2008, pp. 149, 152. 1 2 Dallek 2008, p. 152. ↑ McCoy 1984, pp. 318–19. ↑ Kloetzel & Charles 2012, pp. 50, 61, 71, 91, 99. ↑ McCullough 1992, pp. 952–59, quote on p. 959. ↑ Time& March 24, 1952. ↑ Truman Library, SAR 2012. 1 2 Missouri Partisan Ranger 1995. ↑ Eakin & Hale 1995, p. 71. ↑ Truman School of Public Affairs 2010. ↑ Time& October 17, 1949. ↑ Army National Guard 2012. ↑ "Congressional Gold Medal Recipients". Office of the Clerk. House of Representatives. Archived from the original on July 23, 2011. Retrieved August 20, 2014. ↑ Hall of Famous Missourians 2012. ↑ "Statue of Truman in Athens, Bombed in 1986, Is Restored" . Retrieved 2018-04-27. McCullough, David (1992). Truman . New York: Simon & Schuster. ISBN 978-0-671-86920-5. "The Art of the Possible". Time . June 6, 1949. Retrieved July 25, 2012. (Subscription required (help)). Nevins, Allan (November 6, 1955). "Year of Decisions a 'volume of distinction'". The New York Times Book Review . Weintraub, Stanley (2000). "MacArthur's War Korea and the Undoing of an American Hero". The New York Times . Retrieved September 3, 2012. Miller, Henry I. (August 1, 2012). "The Nuking of Japan was a Tactical and Moral Imperative". Forbes . Retrieved May 10, 2017. Roberts, Geoffrey (December 2000). "Historians and the Cold War". History Today . Retrieved April 4, 2010. "Truman Fellowship". Sandia National Laboratories . Retrieved September 8, 2012. 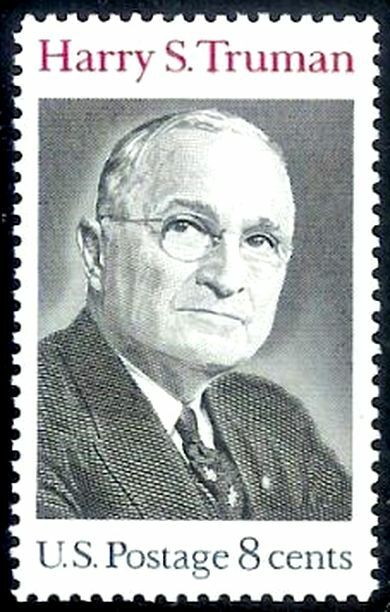 "Harry S. Truman collected news and commentary". The New York Times . United States Congress. "Harry S. Truman (id: T000387)". Biographical Directory of the United States Congress . 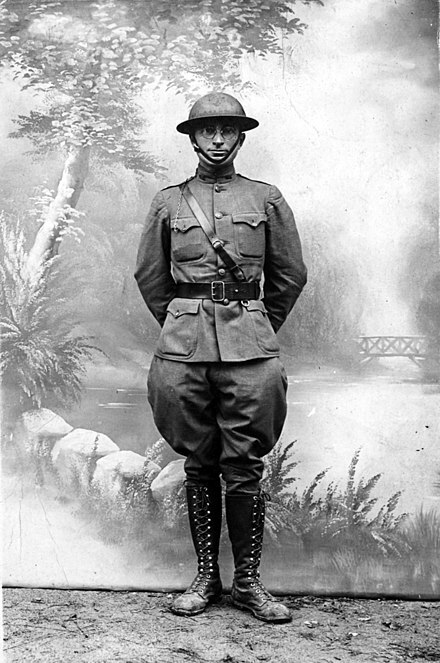 This article incorporates public domain material from the National Archives and Records Administration document "Records of the Adjutant General's Office" .